Do you feel like you’re failing as a manager? Don’t stress. We all get overwhelmed from time to time. The two reasons managers fail are quite simple: over-delegation and under-delegation. When your plate gets overloaded, the tendency is to over delegate tasks in order to manage your workload. Those who over-delegate tend to delegate tasks and then forget about them completely. While this hands-off approach is better for morale than micromanagement, even the most independent workers need periodic check-ins to stay on task. Imagine you’re getting a haircut. Even though your stylist is an expert in hair-cutting technique, they still need some initial direction from you in order to give you what you want. Treat the delegation process in this fashion. If you’re involved early on, you can disengage later. After you explain the haircut you want, you can disengage and let the stylist do their thing. Under-delegation happens when you stay engaged throughout the entire process. This sets you and your team up for failure. You’ll be stressed and overloaded if you’re involved in every single task. Your employees will never take ownership of their work, and this ultimately stunts their professional development. The proper delegation process starts with being very involved in the direction phase. You then disengage during the task to let employees take ownership of their work. The level to which you disengage is directly related to the employee’s experience in the task. Finally, you have to have a way to measure the results after the task is done. This is simple in Sales and marketing, but difficult for operational tasks. The best delegation systems have Key Performance Indicators (KPIs) built in to measure success. Employees put more into a task when they know how to “keep score”. The definition of Management is getting things done through others. This is done through delegation. I’m going to share with you a 4-step delegation process to keep yourself from under-delegating or over-delegating. Step 1: Before delegating a task, you must clearly understand the task yourself. Most of us don’t delegate tasks until our plates are full and we are feeling overwhelmed. In reality, this process needs to start before we feel overloaded. You need to have the time to fully understand each task you delegate, and this is impossible when you have a full plate. Don’t just delegate a given task to the first person who comes to your mind. Be strategic. Each person on your team is a resource, and you want to use your resources as efficiently as possible. Most people let their mind wander when listening to instructions. It’s human nature. Most employees underperform at tasks because they didn’t clearly understand the task’s objective or purpose. A good way to check for comprehension is to have your employee repeat the task directions back to you. The thoroughness of your directions is directly related to the employee’s expertise in the task at hand. You can be more hands-off with those who have a lot of experience, while you have to go into each step in detail with newer employees. 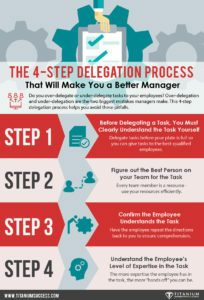 Follow this 4 step process and you’ll be a better manager. Do you need help getting the most out of your employees? 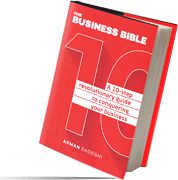 If so, then sign up for an executive coaching session with Arman today.